A group exhibition with works by Burak Delier, Etcétera…, Avi Mograbi, Marina Naprushkina, Trevor Paglen, Cesare Pietroiusti, Jonas Staal, Mladen Stilinović, SUPERFLEX, Milica Tomić, and Lidwien van de Ven. Curated by What, How & for Whom/WHW. The exhibition engages in a dialogue with a provocative claim made by Slovenian sociologist, literary theorist, translator, and political activist Rastko Močnik in his collection of texts titled How Much Fascism? (1995). Močnik suggests that we no longer need to ask ourselves whether “new local populism, new ‘fascism,’ [and] new right-wing extremism” drive the contemporary condition, but rather, how much they drive that condition. We must attend not only to the open manifestations of fascism, though we witness more and more of such instances and one needs to ponder how societies that permit and tolerate such phenomena still “qualify” as democracies. More importantly, WHW suggest, “we need to turn our attention to the silent fascism that is becoming normalized through the systematic violence seeping into the laws and everyday administration practices of the nation-state, and to assess the mechanisms of oppression and the various symptoms of contemporary fascism that are being presented as unavoidable, pragmatic necessities.” In sync with these thoughts, the artists in the exhibition inquire about the possibility of art vis-a-vis such circumstances and invest in the cognitive power of art and the potential within the aesthetic experience of questioning reality. Following the exhibition opening, Part Two of the 3rd FORMER WEST Research Congress: Beyond What Was Contemporary Art takes place on 29 September 2012 at Utrecht School of the Arts, Mariaplaats 28, Utrecht. For more information please visit: www.formerwest.org. 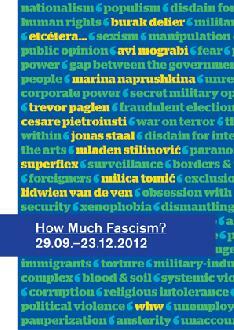 The exhibition How Much Fascism? is curated by What, How & for Whom/WHW. It is a continuation of the exhibition Details at Bergen Kunsthall, Bergen which has been the starting point of ongoing research that will continue with an exhibition at Extra City Kunsthal, Antwerp co-curated with Mihnea Mircan and a series of events within the project Beginning As Well As We Can (How Do We Talk About Fascism?) at Gallery Nova, Zagreb, Grazer Kunstverein, Graz, and Tensta Konsthall, Stockholm. 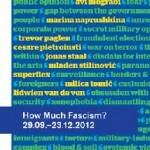 How Much Fascism? at BAK is a research exhibition within the framework of BAK’s long-term project FORMER WEST which is generously supported by the Mondriaan Fund, Amsterdam and the EU Culture Programme, Brussels. After the proclamation of independence of Belarus in 1991, the country adopted the new symbolism: the return of the so-called historical red-white-white flag. The appeal to the “cultural roots, ethnic and historical heritage” on the basis of rejection of the Soviet identity was gathering a large number of supporters in the early 90′s, especially among the intelligentsia. However, in 1995, the first president of the Republic of Belarus Alexander Lukashenko initiated the replacement of the flag and coat of arms for the so-called pro-Soviet version, similar in appearance to the symbolism of the Belarusian Soviet Socialist Republic (BSSR). Thus, the opposition and the ruling power now each appear under their own symbolism and the main political ideologies are clearly visually divided. 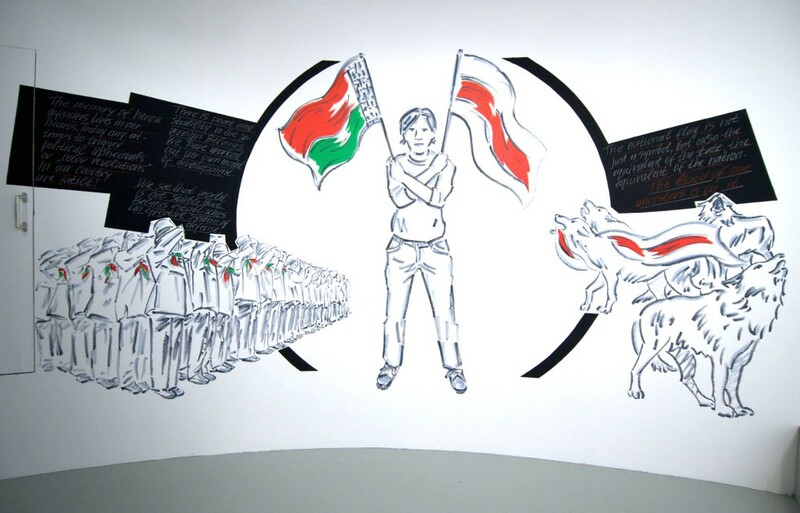 Members of the opposition consider the new flag to be “fascistic” and associative of the repressive regime of Lukashenko; at the same time the red and white flag of the opposition is also rejected by the more liberal-minded population. Under Lukashenko, the Independence Day is celebrated not on the day of the Declaration of State Sovereignty, as it is in many post-Soviet countries, but on the day of liberation of Minsk from the German forces of Nazi Germany. The Second World War and the partisan heritage of the country are the most canonized themes in Belarus. Lukashenko often uses the concept of patriotism, which distinguishes him from more nationalist persuasions of the opposition. During the pompous military parades Lukashenko urges Belarusian people not to forget their heroic past: “We remember the contribution made by the people of Belarus to the defeat of fascism, showing unbending will, courage and strength of spirit.” Yet, under the disguise of anti-fascist propaganda, Lukashenko mainly seeks support and sustains the status quo of the government. In the recent years, demonstrations of the opposition are more and more often held under the flags of the European Union and the common slogans: national sovereignty and the European choice. For years, the opposition has been suffering from the inaction and failure of the EU policy towards Belarus. And does the opposition feel that the requirements of Western politicians on the observance of human rights in Belarus or other countries under the authoritarian rule are due to the fear of invasion of the EU nation states by more migrants, rather than a sincere desire for a democratic change?